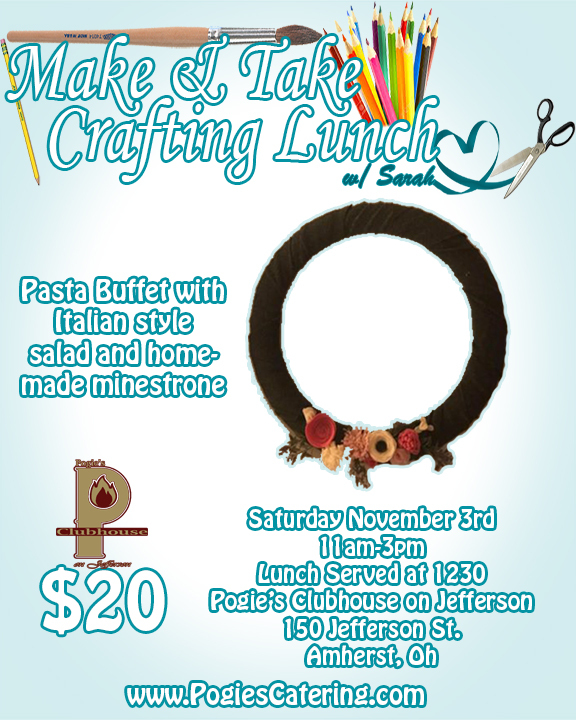 A make & take crafting lunch at Pogie’s Clubhouse in Amherst with Sarah will be held Saturday November 3rd. Come learn the basics of using scrap fabric for making wreaths and flowers. Bring your old sweaters that are itchy, have holes, or are all stretched out to up-cycle in to a beautiful wreath or we will have a selection of scrap fabric for you to choose from. All other supplies needed for the craft will be provided. Pogie’s will serve a pasta buffet with Italian style salad and homemade minestrone for lunch. Clean out your old closets and drawers and come turn your old clothes into something beautiful on Saturday November 3rd at Pogie’s Clubhouse. Tickets are advance sale only and can be purchased online HERE! Fall Make & Take Crafting Lunch facebook page!